Choose from a variety of sizes, shapes, colors, and decorative options when selecting your gutter components, with the assurance that each gutter, downspout, and accessory has been handpicked as part of the Wilco line of dependable, hard-working, and well-crafted products. Installed at the bottom edge of a building’s roof slope to collect water and channel it away from and down a structure (via downspouts). Available in .027 gauge aluminum, 27 colors, 10-foot, 20-foot, and custom lengths. Premium colors in .032 gauge, 3 colors. Installed at the left and right ends of gutter to give a finished look and to encourage water to flow into downspouts rather than off the edges of the roofline. Made from .19 gauge aluminum and available in all colors. Wilco makes its end caps to provide perfect color matches and to avoid common metal cracks in the bottom corners that can lead to warranty issues. Elbows: Wilco elbows are longer than many other elbows to prevent downspouts from becoming clogged with debris and are made of thicker gauge aluminum to prevent metal from cracking. Offsets: Short, 35-degree offsets are perfect for brick ledges, short overhangs, ledges over decks, etc. Our .019 gauge aluminum downspout is available in 8-foot sections (select colors) and 10-foot sections (all colors). These true rectangular downspouts with corner crimping are inspected for tight seams, straightness, and absence of dents and marks. Used to secure downspout to wall. Downspout Straps: Custom made from our coil stock for a perfect color match. Available for use on 3- or 4-inch downspouts with markings for easy 90-degree bends. Clean professional look. Pipe Cletes: No attachment on the front of the downspout gives a streamlined appearance and makes for easy installation. Available in low gloss white for 3- and 4-inch downspouts. Ensures that the downspout extension remains firmly attached to the gutter system to protect your home's foundation. Fits any size downspout, residential or commercial. Installs in 1 minute. Factory white standard, hand or spray paint to match any downspout color. Made in the USA, using 99% recycled aluminum. One size fits all. Each Zip Hinge is 2 pieces. 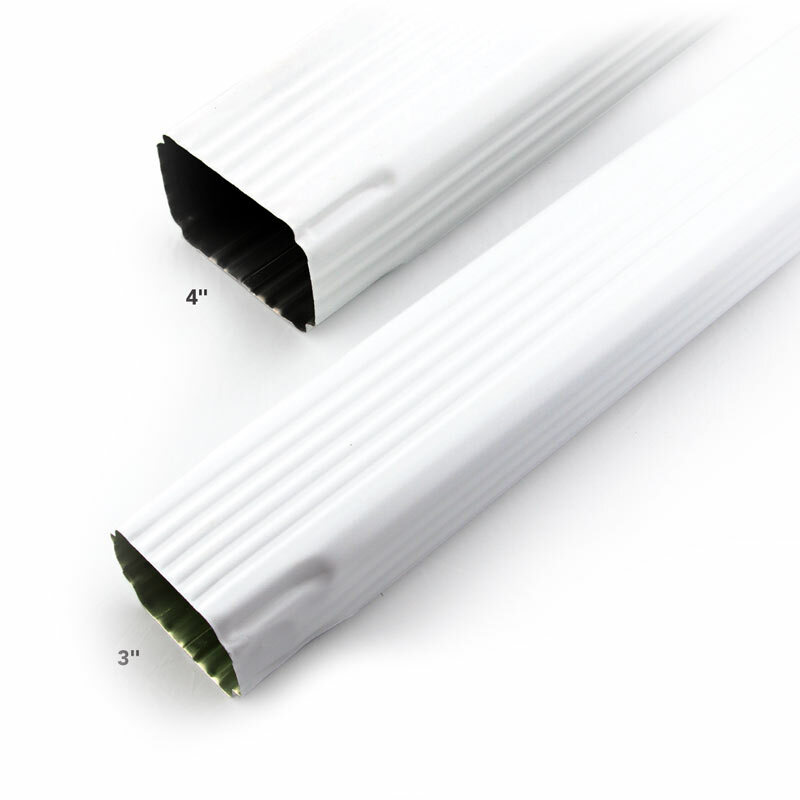 Large upper flange allows for easy installation to inside of the gutter and tapered end fits snuggly in downspout. May screw in place or pop rivet. Caulking is not required nor recommended and may cause a small dam-like area in the gutter that collects debris. Strip Mitres create turns inside or outside 90-degree corners. Bay Mitres used for bay windows or any corner that is less than or greater than 90 degrees. Made from .019 gauge metal that allows for conformation to fit slight variations in gutters, seamless, one-piece construction, and less leaks. Designed for homes that do not have true 90-degree angles or I/S or O/S corners. Strip Mitres available in most colors and Bay Mitres available in low gloss white only. Create inside and outside turns in the guttering system. Made from .019 gauge aluminum for tighter seams, and less chance of leakage due to expansion and contraction. Available in most colors. Funnels direct water from multiple downspouts into one. Used as a holding valve that catches and directs water through a scupper (tube that channels water from the roof, through a wall, and down the side of a structure) to the downspout. Available in low-gloss white, additional colors available by special order. Wedges eliminate difficult installation and adapt to virtually any degree of slope. Used when fascia board is slanted and eliminate the need to nail directly into the roof. contract while accommodating changes in temperature. Recommended for use with long runs of gutter (rule of thumb: each 10-foot increment of gutter needs approximately 1/64th of an inch to contract or expand as the temperature changes +/- 10 degrees). Wedges: Available in mill finish, our new T-WEDGE (top picture), and in traditional style, low-gloss white (bottom picture). Expansion Joints: Available in mill finish with an expandable rubber boot at the center. 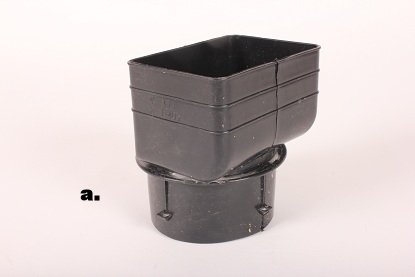 Tile Adapters attach to downspout and allow you to install downspouts into 4-inch black drainage tiles. Tile Adapters: Designed for 3- and 4-inch downspouts and a clean, professional look. Splash Block catches water from downspouts and disperses it from the home, preventing erosion to landscaping. 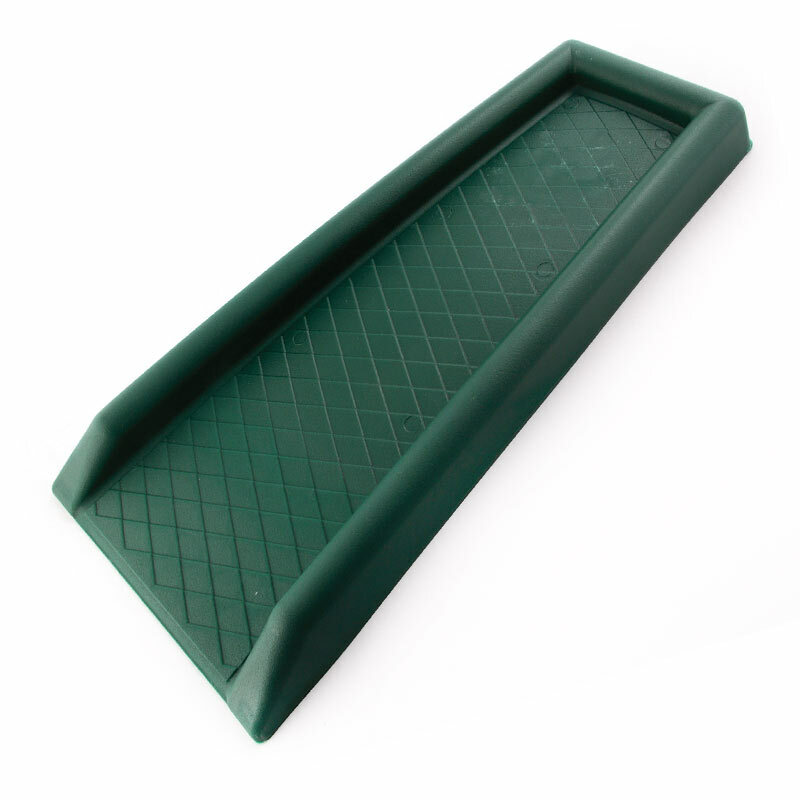 Splash Block: Available in green PVC. As a rule, PVC is more durable, will not crack with weather changes, and is easier to move around.